Starting Quietly has been so much – for lack of a better word – fun. There is a terrifying element to absolute freedom, especially for someone who has spent the majority of their life working within the bureaucratic labyrinth that is post-secondary education or oft-authoritarian realms of hospitality. Suffice to say there has been an added layer of delight to picking producers and roast profiling to create the cups that I deeply love and want to drink every morning. As I very slowly sort and pack orders (we can’t be good at everything right? ), I have been thinking a lot about the term ‘origin’. It is not a phrase exclusive to coffee given its long roots in the world of spirits and wine. It describes the elements of terroir that give a cup its unique flavour impression by way of growing conditions, processing, varietal, or any number of other forces that shape the growth, maturation, and harvesting of coffee. It is my new-found total autonomy in roasting, which really has me pondering the whole ‘origin’ concept. Granted in all my Cut years, I was able to curate and create all the coffee profiles but there was a certain restrictive budget and established expectation for high-solubility and low-to-medium acidity for an easy dial-in and approachable cup. Most companies have either a signature style or fall into larger categories; take for example, the common ‘Nordic’ or ‘Scandinavian’ grouping. Yet within this diversity of approaches, there is a very similar mantra built upon the singular idea of origin. 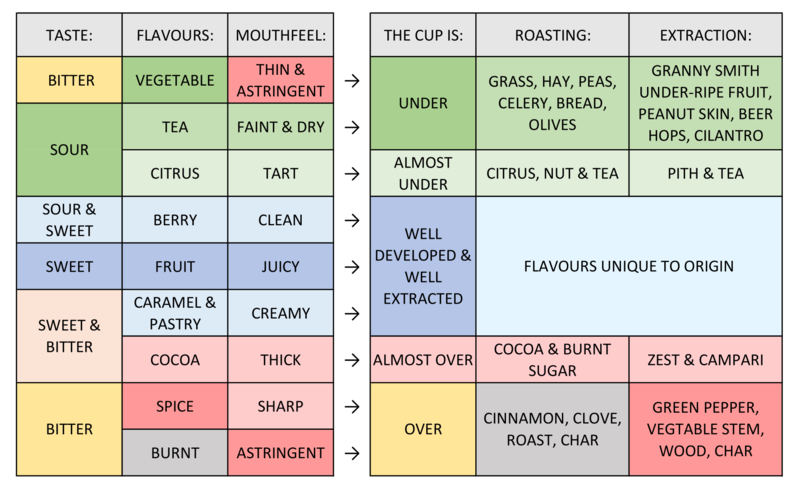 Be it acidity, sweetness, brightness, lightness, or beauty, they all claim to be presenting the unique attributes of flavour inexorably tied to place. To rephrase this as a question: how can such a diversity of roasting methods all actually represent a singular ‘origin’? With my first test batches almost a month ago, I got a fair number of surprised responses. People pointed out that it was a lot more fruity,cleaner, brighter and – ultimately – lighter than when I steered the Cut ship. And my response has been: origin! To answer the question above, I think we have such a plethora of roast approaches all of which claim to operate in service of origin because each one is legitimately attempting to do so. As to the validity of these ‘roasting for origin’ claims, the water gets muddy. Pessimistically, there is a certain amount of hollow marketing; optimistically, like ingredients in a recipe, there are many ways to highlight the best qualities of a strawberry or rhubarb or fresh crop of coffee. So then the question follows: why am I going fruitier, brighter, cleaner and lighter? My singular drive for sweetness often landed in that ‘almost over’ area. Chocolate bars are great but there is a certain danger of ubiquity or generic-ness when everything you roast tastes like bitter chocolate and burnt sugar. With Quietly, I am trying to do a better job of really narrowing in on the unique; no compromises for solubility nor accommodations for approachability. It might sound harsh, but all week, I kept looping back to the philosophy of Emmanuel Levinas to work-through my new stance. I know, I know. SO! Much of the history of philosophy focuses on the selfwith questions like ‘what is being’ or ‘what is it be in the world’. For Levinas, these western traditions use those around us or ‘the other’ in service of the self or the ego. Taken another way, we superimpose the waywe understand ourselves onto others: you are like me, the world is like me, my experience is universal. Levinas argues that we need an ethical shiftaway from this totalizing act achieved by recognizing the absolute unknowable nature of the other. He uses ‘the face‘ both literally and figuratively as a challenge to the dominance of our enclosed ‘me’ experience. Through it, we confront otherness in a way we cannot reduce, possess, or diminish. If you are close to someone reading this, take a moment and look at their face. For Levinas, you are encountering the infinite. You may have knowledge of bits and pieces of their experience but it is always holding back with an unreachable alterity. And this is important because it works as a call of responsibility to treat them well. As I sit weighing bags and packing up boxes, I am trying to think aboutorigin in a new way. I no longer want to dictate that it is only through sweetness that we can experience it because that works against the very notion of the unique, the individual, and the transitory sensory impressions of place. If I can crudely map Levinas onto the argument here: origin should never be understood as something conquerable, solvable, or as something to control. It must be taken as something beyond. As Levinas states, it is in understanding our infinite responsibility to the other that we live ethically. I think that currently comes with me pushing brighter, lighter, more beautiful cups, but again, I do not want to universalize. My motto is: every coffee is unique, each cup quietly tells a story. And I guess that is how I am roasting, at least for now.